Students and recent graduates of all nationalities may apply if they are enrolled in or recently graduated from a university in Bosnia and Herzegovina, Denmark, France, Germany, Greece, the Netherlands, Poland, Ukraine and the United States. Intensive and demanding, the Humanity in Action Fellowship brings together international groups of university students and recent graduates to explore national histories of discrimination and resistance, as well as examples of issues affecting different minority groups today. Our one-year Fellowship program welcomes college and university students and recent graduates from Bosnia and Herzegovina, Denmark, France, Germany, Greece, Poland, the Netherlands, the United States, and Ukraine. Fellows participate in intensive four-week educational programs located in cities across Europe and the United States, with approximately 20 local and international students in each program. Each program provides a site-specific curriculum for understanding the historical and cultural context in which challenges to pluralism and liberal democracy occur. The programs are interdisciplinary, collaborative, and engaged learning experiences; they feature lectures and discussions with researchers, journalists, politicians, activists, and artists, as well as site visits to government agencies, non-profit and community organizations, museums, and cultural and memorial sites. The goal of these programs is to foster cross-cultural understanding and an appreciation of different perspectives and approaches for assessing past and contemporary social justice issues. After the four-week on-site educational programs, Fellows return to their countries to develop and implement Action Projects to address social justice issues in their own communities. Past Action Projects have ranged from the production of documentaries and theatrical plays to community organizing projects, campaigns and social enterprises. The Action Project implementation stage is not a full-time commitment and is individually completed as the Fellow continues their education or career. 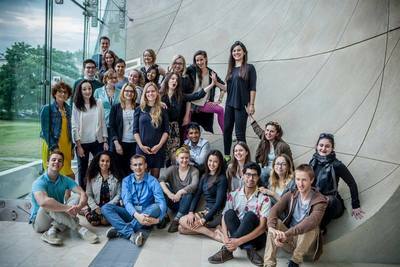 Featured: 2015 Humanity in Action Fellowship program in Warsaw. The video is in both English and Polish. Graduates of the one-year Fellowship program then are invited to join a transatlantic network of over 2,000 alumni as Senior Fellows. Senior Fellows have developed careers as entrepreneurs, artists, scientists, journalists, researchers, performers, writers and professionals from all disciplines, united by a shared commitment to advancing human rights through civic engagement. Humanity in Action provides Senior Fellows with opportunities for continued learning and engagement through annual international conferences on both sides of the Atlantic, professional Fellowship programs, study tours, grant competitions and more. Why Choose the Humanity In Action Fellowship? The diversity of our Fellows deeply enriches Humanity In Action programs by bringing together participants who represent many different nationalities, perspectives and personal experiences with human and minority rights issues. Our curriculum offers an opportunity for Fellows to interact with with leading thinkers and activists on the cutting edge of human rights, historical inquiry and social innovation in their societies. Fellows share the knowledge they gain in their Humanity In Action program through published articles and social media campaigns that draw attention to issues and action that are explored during the Fellowship. The Humanity In Action Fellowship is just the starting point for lifelong opportunities to learn, collaborate and take action through the Humanity In Action Senior Fellows network.